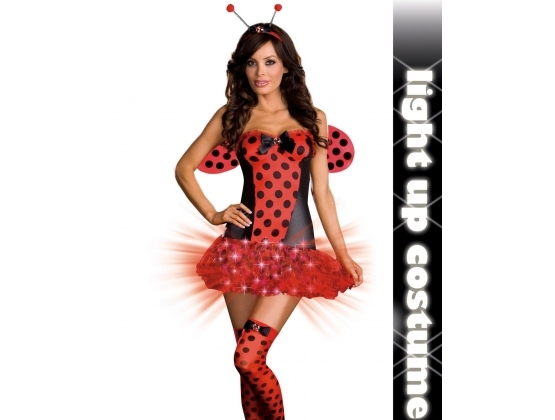 Light Me Up Ladybug Costume by Dream Girl Lingerie is now available at the best adult costume and novelty store online. Light up and stand out tonight! There's nothing cuter than a lady bug - and there's just soemthing extra special about this one from Dreamgirl. Could it be the figure hugging outfit, or the fast that it lights up in the skirt, or maybe it's the delightfully cute wings. Whatever the reason, Dreamgirl is certainly showing off with this ladybug outfit. The Shiny knit dress with the jeweled satin bow detailing is completed by the layered petticoat skirt. It's the skirt which had the fiber optic lights and there's a hidden pocket so that you can easily turn the lights on and off. Complete with jeweled headband and antennae, and red and black thigh high stockings with jewelled satin bows on the tip.